In the words of Dr. Richard Kimble's lawyer, let's talk about this whole thing with the arm. If you've heard about 127 Hours, then you know what I'm talking about. 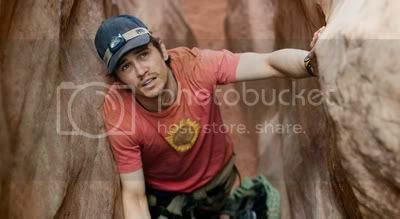 Director Danny Boyle (Slumdog Millionaire, 28 Days Later, Trainspotting) chronicles the harrowing true-life ordeal of rock climber Aron Ralston (James Franco) who was trapped by a fallen boulder at Robbers Roost in Utah for five days. Ralston was forced to sever the trapped part of his arm with the tiny blade of a multitool in order to escape, and 127 Hours's depiction of this trauma has caused a bit of a stir. I've read online reports of moviegoers fainting, vomiting, and even having seizures in response to this scene, and I have to admit it made me think twice about seeing the film. But I wasn't going to skip my first Movie Club review because I was afraid of one scene, I wasn't about to admit that I was afraid of the scene, and hell, if it really was that intense, I wanted to be able to say I'd watched it. For the first half hour or so, my dread for the arm scene deeply colored my viewing. When Ralston took a nasty spill on his mountain bike, somehow even though I knew it would have nothing to do with the injury that would trap the character and that bike mishaps rarely cause rock climbers to cut their limbs off, I winced in anticipation of the infamous scene I knew was coming eventually. When Ralston did something as simple as run his arm against a wall of rock, I would find myself thinking "Enjoy it, buddy, you're not going to be able to do that for much longer." 127 Hours is more than a build-up to watching the Green Goblin's kid hack his arm off, though, and soon I was immersed more in the story I was seeing on the screen than the one I had read about on the Internet or heard about at work. Aron Ralston's story is perfect for Boyle precisely because of why you might think it's a story that's absolutely not perfect for Boyle. His fast-paced, sometimes dizzying style of directing is something you might expect in a British-made heist flick, but not a man vs. nature story like 127 Hours. Knowing what the plot entailed, I was a little confused when the movie opened on shots of crowds milling through city streets and cheering in sports arenas to the kind of loud, enthusiastic rock music you'd expect to hear in a commercial advertising energy drinks and extreme sports. You practically expect Ralston to skid his bike to a halt on the way to Robber's Roost and yell "DO THE DEW!" into the camera. After the boulder traps Ralston, you expect the music to calm down but it doesn't. You expect the quick, hectic cuts to slow down, but they don't. Boyle fills aerial shots of the crevice in which Ralston is trapped with loud rock, and the result is you feel Ralston's overwhelming loneliness and complete severance from the rest of humanity. The music, technology, and pop culture references that litter this dark crack in the ground where Ralston is slowly dying reminds you precisely of what Ralston yearns for; what he's been cut off from. And Boyle doesn't do this in a self-righteous, preachy way. There's no sense of "How dare man think he can overcome nature!" or "Man has grown soft in the face of nature and should be more prepared to deal with raining boulders!" or any malarkey like that. Ralston's memories, thoughts, hallucinations and premonitions of what is going on in the world beyond him and his rock are filled with no judgment, just the yearning of a trapped child wanting to return to the human family. Franco does a magnificent job and is utterly convincing as Ralston. You can't help but feel for the guy and wonder how many times Boyle told him "Okay, so in this scene, you're in a lot of pain." I thought Boyle pushed Franco to the edge of believability in a scene in which Ralston records himself in a mock TV interview about his situation. The scene offers exposition and comic relief but skirts the edge of feeling like something someone under that kind of duress really wouldn't do, but we'd like to think he would because it's entertaining in a Nicholson-in-The-Shining kind of way. In the end, it works well and gives you some much needed chuckles. As for the arm scene, yes it's tough to watch. It is gross and intense. It will certainly make you wince and you probably won't make it through the whole thing without looking away a few times. What's truly genius about the scene is that it isn't so much what you're seeing that makes you cringe, but what you're not seeing and more importantly what you're hearing. I don't want to give too much away, but there's a particular sound effect the filmmakers use for a very specific moment in the arm-cutting scene that conveys Ralston's agony more than any fake blood or prosthetics ever could. But unless you have a truly weak stomach for blood in movies, I wouldn't roll an oxygen tank into the theater and I certainly wouldn't let what you've heard about the scene keep you from seeing it. 127 Hours is powerful, heart-wrenching and uplifting. It isn't necessarily the kind of movie you'll want to watch over and over again, but you definitely need to see it once.